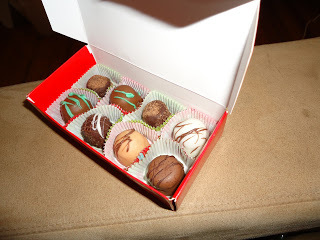 This is a box of my husband’s famous Christmas ganache chocolates. He makes them every year for his family, and now mine. This year I convinced him to make flavored chocolates: rum, peppermint and orange. He flavors the chocolate for centers, lets them cool in molds and then dips them in more chocolate. After they dry, he drizzles a different color of chocolate on top for contrast. Scott’s chocolates are famous in his family. They are so good, he hasn’t tasted any better. Right now I’m drooling over a peppermint flavored chocolate. I love peppermint flavored anything! Have a Merry Christmas also. The ganache chocolates look delicious.